Appearance of thick hair on upper lip region are quite annoying for women and badly affect their natural femininity. Sometimes this unwanted hair growth becomes very thick and give them an appearance of moustaches similar to men. Beauty conscious spend a lot of money on expensive commercial products to get rid of unwanted upper lips hair but usually don't get the desired results. Let's have a look on some common causes behind unwanted upper lip hair in females. However, It is not necessary to visit the parlor or beauty salon every time you need to get rid of your upper lip hair. 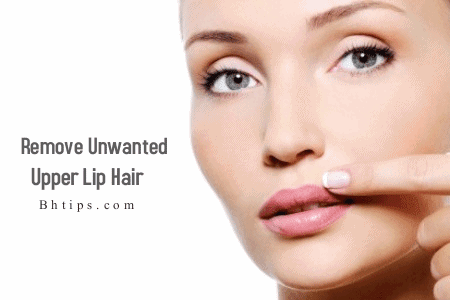 Luckily here we have some natural remedies to get rid of unwanted upper lip hair. When we talk about hair removal home remedies Turmeric comes at the top of the list. You can mix some turmeric powder with some milk and make a thick paste and apply it to your upper lip area. Wait till it becomes dry. Finally remove the paste by rubbing your finger tips. Regular application will definitely slow down the hair growth and eventually you will get rid off unwanted thick upper lip hairs. If you don't have milk at home you can simply mix some turmeric powder with some water and make a thick paste. Similarly apply this paste on region of your upper lip and leave until it become dry and finally remove this by scrubbing. Finally wash off with fresh water. Repeat this on daily basis and see the difference within few days. Take some gram flour and mix with some turmeric powder and milk. Blend well to make a thick paste. Now add 1 teaspoon of fresh cream. Let it stay, until it gets dry. Finally scrub it off against the direction of hair growth. This home remedy will easily take off unwanted upper lip hair. Make a mixture by adding some gram flour, yogurt and turmeric. Massage the upper lip region, using this paste. Leave it, until it gets dry. Remove it by rubbing against the direction of hair growth. Finally wash off with fresh water. A mixture of Egg white, corn flour and sugar is also very effective in reducing the growth of unwanted hair. Take egg white and one teaspoon of corn flour and 1 teaspoon of sugar. Mix it, until it becomes a sticky paste. Apply it on upper lip region. Wait for few minutes and peel it off, when it gets dry. Repeat this at least thrice a week. Regular application of this home made technique will slow down the growth of unwanted hair. Make a mixture by adding 1 tablespoon of lemon juice, 1 teaspoon of sugar and 1 tablespoon of water. Mix all the ingredients to make a thick paste. Now apply this mixture on your upper lips for at least for 15 minutes and finally wash off with cold water. Regular application will also reduce the growth of upper lip hair. Sugar waxing is a temporary but quick, safe and chemical free method to remove upper lips hair. Sugar waxing pulls the hair out by the roots and generally lasts for 2-3 weeks. You can make sugar wax at home simply by mixing 3 tablespoons of sugar, 1 tablespoon of lemon juice and 1 tablespoon water. Heat this mixture in a frying pan over a low flame and keep stirring till it completely melt.You will get a thick brown liquid and wait until it become cool enough to apply on skin. By using a clean butter knife apply this on upper lips in direction of hair growth. Finally by using a clean cloth or any waxing strip, pull it in the opposite direction of the hair growth. Once done, wash the region with ice cold water and apply ice cube over the area to tighten the skin pores. Threading is an excellent hair removing option for small areas like the upper lip. This is quite simple and inexpensive even you can perform simply at home. Besides being inexpensive it is also chemical free and really doesn't involve any harmful chemicals. Usually threading is performed by twisting two cotton thread strands together and then catching each upper-lip hair in the thread. When this happens, it's then pulled or "threaded" out from the roots. By using this simple home technique you will remain hair free for up to two to three weeks.